Series Debut: From J.J. Abrams comes the futuristic—2048, to be exact—tale of a police force that mandates that every cop be partnered with a human-like cyborg. 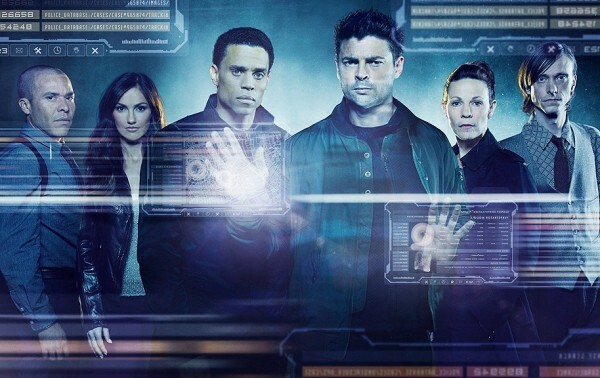 Naturally, veteran officer John Kennex (Star Trek’s Karl Urban) hates machines, but reluctantly comes to trust his new crime-fighting iPartner (Michael Ealy). It all sounds suspiciously like a 1992 series called Mann & Machine (or maybe even 1976’s Holmes & Yo-Yo—go ahead, look it up), but so what? J.J. Abrams! Future robot cops! Like Fox’s left-field hit Sleepy Hollow (which it will be paired with on Mondays after tonight), Almost Human mixes the fantastical with enough humor and, well, humanity, to connect with The Masses better than previous sci-fi forays like the mind-effing Fringe, and Urban is just straight-up cool. Should be a hit … emphasis on should. Season Premiere: In its first two seasons, Chris Elliott’s Eagleheart fought and exacerbated different crimes-of-the-week in each episode; his Marshal Chris Monsanto may be prone to psychotic violence and gratuitous collateral damage, but he gets the job done (pay attention, Deputy Rick Grimes). This time around, Eagleheart is a serialized 10-part saga, subtitled Paradise Rising, centered around the death-by-woodchipper of Marshal Brett (Brett Gellman) and Monsanto’s quest to clear his own name in a vast murder conspiracy that, somehow, involves Martin Sheen (Martin Sheen). There’s also the usual epic bloodshed, body count and general mistreatment of Marshal Susie (Maria Thayer); Eagleheart is still in touch with its roots, after all. Series Debut: Since it was co-created by Bill Lawrence (Cougar Town, Scrubs), The Only TV Column That Matters™ enjoyed a millisecond of hope that Ground Floor wouldn’t be just another craptastic TBS sitcom with an abrasive, tacked-on laugh track. Guess what? It’s just another craptastic TBS sitcom with an abrasive, tacked-on laugh track—and it also completely wastes the comedic talent of Scrubs alum John C. McGinley. Not that this corporate-office-place “comedy” looks expensive (it was probably shot on the Men at Work set during lunch breaks), but TBS could have saved time and money by just buying rerun rights to the legitimately funny Better Off Ted and called it good. Do I have to run all the networks? Season Premiere: Speaking of running networks, who the hell decided that Dads should be leading off Tuesday nights while Raising Hope, the show that got Fox back in the comedy game, is banished to Fridays? While we’re at it, how is The X Factor still a thing? Anyway: Season 4 of Raising Hope will be burned off, er, presented, in back-to-back Friday twofers until the network gets around to joining it up with still-in-reserve military sitcom Enlisted sometime in January. You know, if it lasts that long here—watch now, watch hard.